Want a Better Customer Experience? Ask the Front-Line! | The Taylor Reach Group Inc. Customer Experience (CX) can differentiate your company from your competitors. An effortless Customer Experience creates loyalty for your brand. Your customers could be yours for a lifetime! You know how much that’s worth to your organization. You want to provide the best Customer Experience possible. But how? Perhaps you’d like to investigate the Customer Experience for your organization, but you don’t have the time or resources right now to do extensive surveys and customer focus groups. Does that mean you can’t do anything to improve the Customer Experience today? Not at all. The easiest and least expensive way to learn about the Customer Experience in your organization is to ask your front-line associates. They know what bothers the customers, they know what makes them happy, and they’d really like to share! First, your front-line associates have to trust you. That doesn’t start when you walk into a conference room for a listening session with them. Building trust is an everyday proposition. It means you speak to them when you see them in the hallway, you know their names, and you answer questions when they’re asked of you. You follow up, you keep your promises and you tell the truth. If that’s what’s happening every day, they will be happy to share with you. Gather your front-line associates in small groups for listening sessions, no more than 15 at a time, so everyone gets a chance to share. Tell them what you’re looking for in advance, so they have time to think about their answers. Facilitate the discussion carefully—you don’t want one or two dominating the conversation. Start with something like, “What do our customers love about dealing with us?” and make sure everyone gets a chance to answer. You’ll probably want someone else to write answers on a board at the front of the room, because it can be difficult to engage in conversation and write everything down at the same time. Then move to the more challenging, “What do our customers wish we would change?” That single question will probably create enough conversation for the rest of the meeting, which should not be scheduled for more than an hour. This is not your chance to explain the reason behind every unpopular policy. This is the time to listen without judgment, get clarification as you need it, and record issues and concerns so you can figure out what can be changed. This is a listening session, with the focus on listening, not lecturing. If you’re defensive, you’ll erode trust and make it less likely you’ll get candid feedback in the future. Wrap up the listening session by gaining consensus on the most critical points to address. The issues should be listed at the front of the room. You want people to indicate which they think are most important. This can be done in a number of ways, including having people put checkmarks next to their favorites or having them rank the ideas in order of importance. I like “10/4 voting” where each person gets 10 votes, which they can apply to any of the ideas, no more than four votes to any one idea. Regardless of your method, you want to end up with a prioritized list of potential process improvements. Many of the ideas will likely need some research to determine feasibility. Some will have to remain as they are for reasons that are beyond your control. You may have even known some of that during the meeting, but you were taking the suggestions without judgment, so you kept that to yourself. Some will be absolutely doable, and you’ll all be asking why nobody ever thought of them before. Engage your team in figuring out which is which and creating action plans. If people feel like their suggestions went nowhere, they’ll have nothing to say the next time you ask. You want to give feedback on all of the process improvement ideas. A spreadsheet listing the ideas, research notes, action items, responsible parties and milestone dates could be shared by email or posted in the department, with regular updates. Celebrate the successes when front-line ideas are implemented. You may want to implement a suggestion program where people can add new ideas whenever they think of them—just make sure you’re ready to commit to following up on every one. There’s no reason to wait to learn more about the Customer Experience. Just ask the front-line and be ready to act on their feedback. 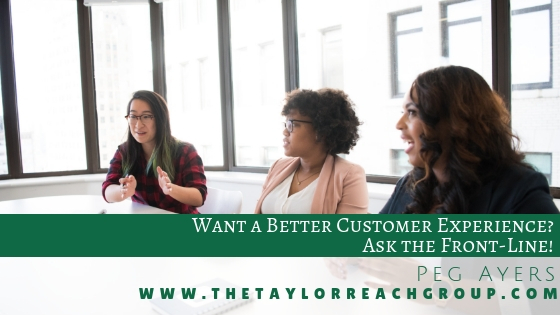 To find out more about how Taylor Reach can help your company with improving the customer experience, CLICK HERE to schedule a free consultation.